East Africa: Crises in the Region - Is the EAC Secretariat a Toothless Watchdog? 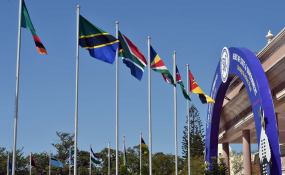 SADC Extraordinary Summit of Heads and Government. The East African Community Secretariat has been criticised for its inaction as the crisis between Uganda and Rwanda escalates, but does it have the teeth to deal with it? While secretary-general Liberat Mfumukeko has insisted that the Secretariat and its institutions are working to resolve the matter, the affected businesses and citizens say it has taken too long. Some doubt that anything can be done without the involvement of the Summit. According to Mr Mfumukeko, mechanisms have been put in place to deal with disagreements among EAC states. While this is partly true for the Burundian government, which involved the Summit of Heads of State at a time when it was stalling the intervention of international bodies like the African Union, the United Nations and the European Union, other disagreements at the EAC have either had to resolve themselves or have been allowed to fester. For example, a 2013 rift between Tanzanian president Jakaya Kikwete and Rwanda's Paul Kagame was resolved through constitutional attrition after the Tanzanian leader's term ended and he was replaced by President John Pombe Magufuli. The borders between Burundi and Rwanda do not operate fully because of a row between the two countries. Just like the case with Uganda now, Rwandans are "encouraged" not to visit Burundi. Burundian government officials do not visit Rwanda either. Vehicles registered in Rwanda do not enter Burundi and vice versa. In addition to lack of an actual mechanism to show the EAC's abilities to resolve inter-country disagreements, Mr Mfumukeko finds himself at a crossroads on how to deal with his bosses, the presidents who constitute the summit. While he claims to have constituted and dispatched experts to both Uganda and Rwanda on a fact-finding mission, some of his staff who spoke to The EastAfrican say no such team has been established, let alone dispatched. "To the best of my knowledge, the experts have not yet been constituted. The Secretariat proposes and the Council of Ministers constitutes and dispatches. All that has not yet been initiated, so I am at a loss," said an official. But the secretary general, speaking in Nairobi, promised to issue a report on the matter "very soon." On whether the EAC has such mechanisms to resolve problems like the current rift between Uganda and Rwanda, the consensus is that there is none. Dan Wandera Ogola, a lawyer and former member of the East African Legislative Assembly, says there are mechanisms to resolve breaches of the existing protocols, which include the Customs Union, Common Market Protocol, and Monetary Union. In the case of breaches to these protocols, affected persons can appeal for intervention at the East African Court of Justice. "But for political problems that are beyond mere contravention of protocols and laws, there is no adequate mechanism to sanction a member that has failed to observe the fundamental principles of the treaty," he says. He says the EAC Treaty depends on the Summit to handle situations by suspending the partner states that fail to observe and fulfil the fundamental principles and objectives of the Community. But the framers of the Treaty seemed to have been thinking of things like the refusal by a partner state to pay EAC dues. Situations like the current one between Uganda and Rwanda were not anticipated. In the case between Rwanda and Uganda, a partner state could be accused of breaching provisions of the EAC Treaty, but Mr Ogalo says the Summit is unlikely to deal with this situation, since both the leaders of the two countries carry significant clout. He suggests that the East African Legislative Assembly consider using its power to enact a law that provides for the resolution of rifts like the current one between Uganda and Rwanda. He says that the framers of treaty having recognised that among other things, the first EAC collapsed due to lack of political will among heads of state, the region resolved to be business-led and people-centred but this has not been achieved in practice, as the Summit still has sway and veto powers over everyone else. For example, an official told The EastAfrican that EALA had only referenced the Uganda and Rwanda situation without mentioning the two countries at the request of the Speaker of the Assembly. With EALA members keen not to offend their Speaker, who gagged them as a mechanism to protect Rwanda, which nominated him, the heads of state Summit is being looked at for a solution. Current EAC rules leave the fate of EALA members in the hands of ruling governments. This is especially the case for Uganda and Rwanda, where the ruling parties have significant majorities in Parliament. Since national Parliaments elect members of EALA, the Presidents whose parties are in charge have significant control. Mathias Kasamba, an EALA member said that as the regional assembly, they did not have to do anything to resolve the situation between Rwanda and Uganda since it was being resolved at the highest level possible--the Summit. He cited the bilateral talks that had taken place between Presidents Uhuru Kenyatta and Yoweri Museveni. He also pointed to the talks between President Kagame, John Magufuli and Kenyatta. Yet there has been no evidence that these talks resulted in improved relations, as a day after President Kenyatta left Uganda and Rwanda there seemed to be an escalation. On March 13, a day after President Kenyatta's visit, Uganda's foreign minister Sam Kutesa officially accused Rwanda of establishing a trade embargo. Mr Kutesa's previous statement on the Rwanda, Uganda situation was more restrained. Relations between Uganda and Rwanda have been strained since the end of February. Uganda is accused of illegally detaining and sometimes deporting Rwandans without access to proper consular services and the judiciary. Uganda has since started bringing Rwandans to court and according to Mr Kutesa, consular services are now available to all detainees that need them. Uganda is also accused of harbouring Rwanda's enemies.